Hi everyone! Welcome to Friday's Fave Five. Please join in as we look back over the week and look for blessings in our lives, things that made us smile, uplifted us, helped us to take another step. They may be big or they may be small, they may have big impact or just be something that may have slipped by had you not paused to think about it. Whatever they are they are helping us to cultivate a grateful attitude. Of note, I have put my comments to being moderated in the hopes that I will know that people have commented. Once Blogger gets it together and gets this thing figured out, then I'll put it back. Unless of course this doesn't work and then we'll be back to square 1. I have been checking the Blogger comments in my account once a day but I'd rather get the email. And hopefully it will let me email back. We shall see. So this week has gotten away from me with interviewing families for work to fill some spots for the fall and my Dad's health issues. So today's Fave Five is going to feature my five favorite flowers in my garden or flower pots this year. I notice that they bring me a lot of joy. The splashes of color and all the variety of shapes just make me happy. I don't know the names of them all but maybe the pics will bring a smile to you too. ~ Nicotiana ~ otherwise known as Flowering Tobacco. I tend to choose this lovely little plant quite often in my rotation through the years. I just love them. They usually come in a variety pack so you never know what number of what colors you will get but that's ok, I love them all. They are beautiful in their simplicity with their trumpet like flowers clustered together on their stems. This is my favorite color one this year, but they also come in red, a yellowy-white, and dark pink. ~ hostas~ I love me a lovely hosta. They are so gorgeous, loving those shady spots where you just don't what to put. I can get really carried away in the hosta section. They come in so many varieties with lovely leaves of different shapes and sizes and variations of green, yellow and white. This baby is doing quite well in the spot in the backyard that used to house the wooden garbage can bin that is no longer needed. 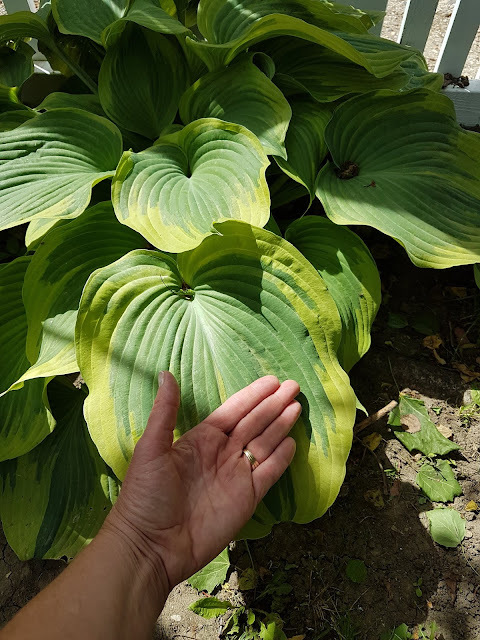 It is a hosta that has done well, due to one fact and one fact only... I've basically left this one alone! I tend to rearrange my garden and so things don't grow so big, but because of how this beauty is doing I am learning to leave them be! Look at the size of those leaves. This hosta is about 4 years old now. 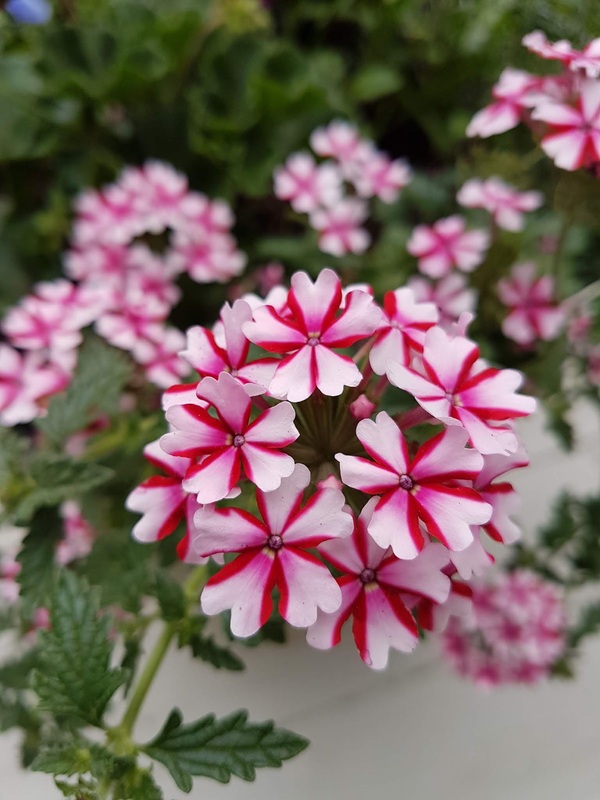 ~ Verbena~ this is a staple I put in my deck pot every year. This year I found this lovely "Candy Cane Stripe" variation. So pretty. Love how these flowers drape and hang. ~? ?~ I can't remember the name of these lovely, dainty little flowers at all. 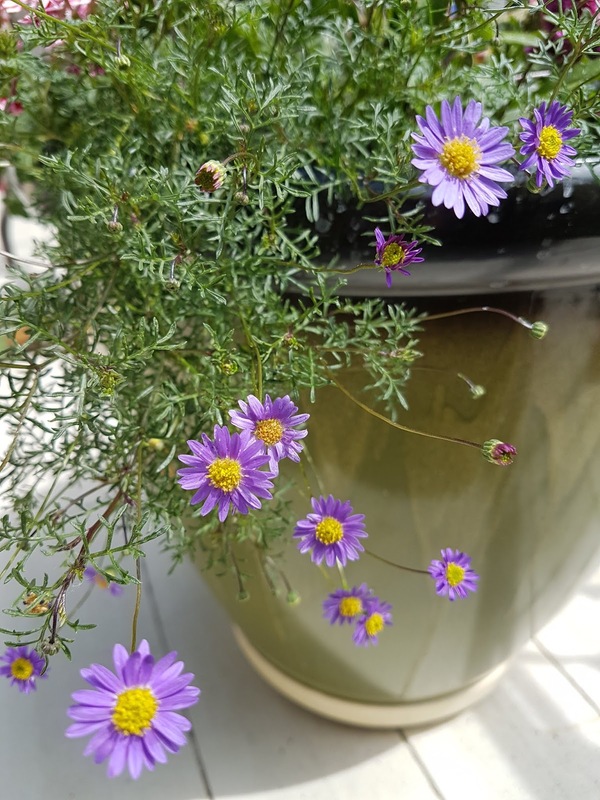 I nab them whenever I see them for my pot on the deck because they are so delicate and lacy looking and they remind me of a little mini daisy which to me is a cheerful flower. ~ wishbone flower ~ these delicate little things are new to me this year and I just love them. I got the last pack of 4 left at the greenhouse, they were just sitting there looking lonely so I grabbed them and added this great green nesty thing into the middle. I have no idea what it's name is. It has these great curly cue things and is pretty unique. Yes it's real and not plastic or wire though it looks and feels like it. So that is my favorite blessings, garden version. What were your favorite blessings this week? 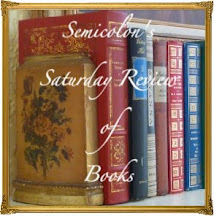 I help myself with the reading list in Blogger or I open my post and see who has commented ! It's very annoying. I have given up hope that they will repair it, it's now so long ! I have to google a bit to see more ! 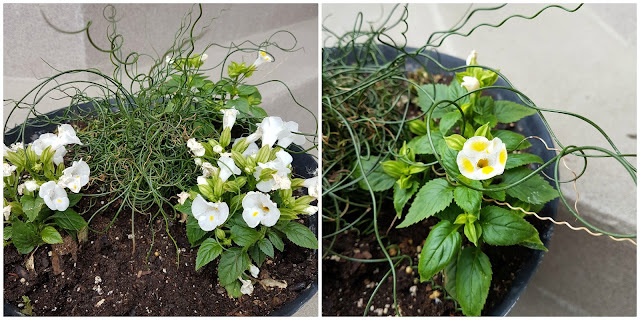 Your flower pictures are gorgeous ! I don't think that comment moderation will work. Even wordpress blog comments don't arrive in the email. Keep us informed ! I think that little purple flower is an Aster or a Michaelmas daisy. I could be wrong though because they both flower more toward September. Very pretty flowers. I hope things go well with your interviews and with your dad's health. 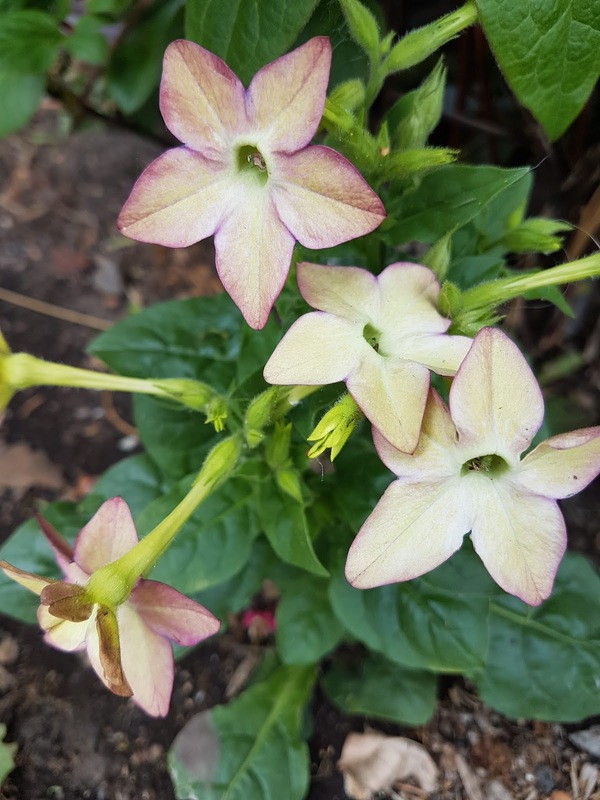 I had not heard of nicotiana - it's pretty! I like the little curlicue things, too. I've gotten verbena some years - very pretty. I agree, I love the color and variation and prettiness flowers add to our living areas this time of year. Oh, so, gorgeous! You definitely have a green thumb. The Blogger issue is driving me crazy. I, too, like to respond to comments via email. I tried subscribing to my comments, but those come in as no-reply blogger, so that didn't help. Also, a few of my blog friends were unable to comment at all, due to the fact that I had my comments "imbedded" below the post. I had to change my settings to this pop-up window for them to be able to comment. I'm not sure why Blogger had to make some sort of change that messed everything up. Lovely flowers to enjoy, Susanne. Hope things even out for your father and that your spots are filled. Flowers are a true blessing! Our God is so creative!! I have hostas as wel but mine look different. They are green and white and sit under my cherry tree that is closest,to our driveway. I love those purple flowers in your pot!!! I have similarmones in purple and white. I'm gonna try to write my FFF after our Father's Day celebration if it isn't too late. 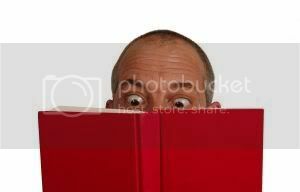 I've had no trouble seeing my comments!! Good luck! Well it's Monday and I'm finally here! Your flowers are lovely. I hope you got the interviews sorted and your Dad is doing okay. Yep the comments thing is annoying. I'm getting used to working around it.